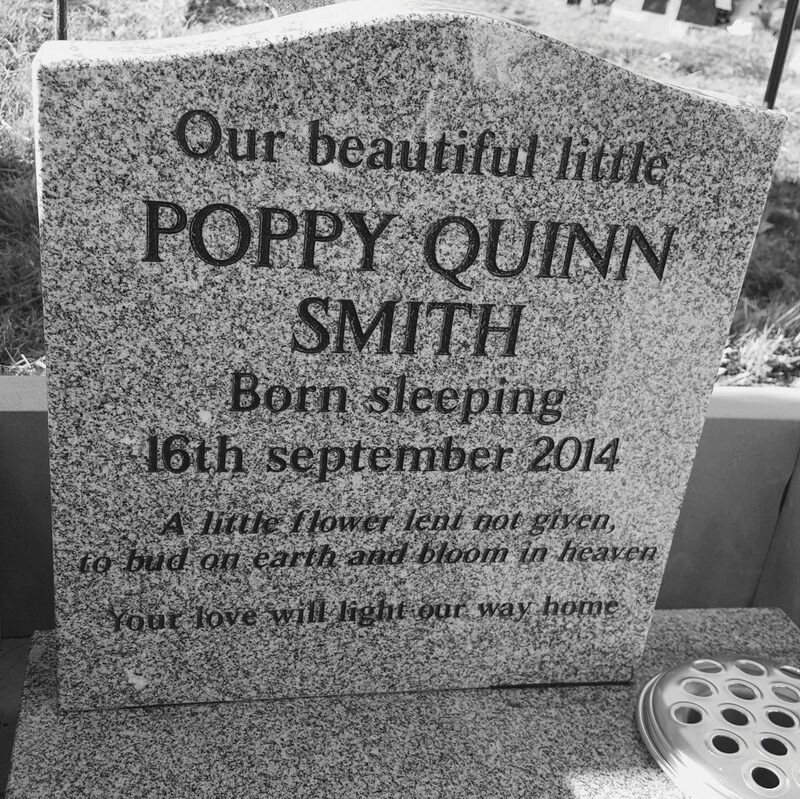 Having a headstone on our daughters grave has been an incredibly sensitive and long decision to make. It has been one of those decisions we have had to make as a result of stillbirth that feels so completely unfair and wrong. The agonizing choice to take the name you so lovingly picked out in pregnancy and place it above the due date you were given, to be engraved on a headstone, is a task far too big than I have had strength for. It is beyond hard and to put something so final there makes our memories and daily life a reality to the world. Whilst to place the headstone on her grave would make it more aesthetically pleasing and comforting, it felt to me such a huge and final thing to do. But then, earlier this year we finally pushed ourselves to do it and when I received the email on wednesday evening to say they had finished and fitted it, I was both excited and anxious. I was excited to see it in real life, but I was anxious that it might not be right (or rather that it might hurt too much again to see her name there). When we arrived though we were all so delighted to see how truly lovely it looked. The kids hugged it and shouted with glee as they celebrated their sister and her little marked plot in this world! To finally cement and make it all real did feel strange, but to finally tell all around where she lay, who she was, how much love we have for her and who we lost, was both a moment of pride as well as heartache. 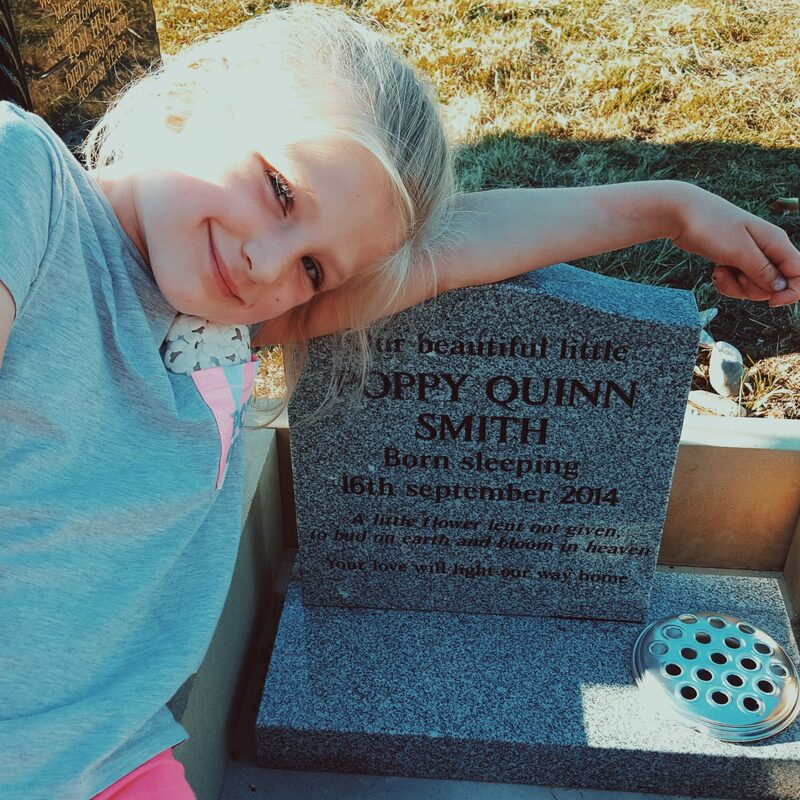 We decided to write “Our Beautiful little Poppy Quinn Smith” because to us she will always be ours – Our little Poppy and our beautiful little girl. To many people stillborn babies are an uncomfortable sight and concept, but to those whose babies have died will know they are beautiful all the same and we wanted the world to know that this right here is our beautiful little girl. We chose to put “Born sleeping” as it is a widely recognised (and a much softer) way of saying that she was stillborn. We took a while to put this line as nothing felt right and I sometimes get mad at the “Born sleeping” term – she wasn’t asleep because she never woke up. But after much deliberation it kinda just felt like the best thing to put to let people know how we lost her and it reflected how we initially chose to tell friends and family of her birth too. “A little flower lent not given, to bud on earth and bloom in heaven” – when I first read these words the year after we had her they spoke volumes to me. Our little flower perhaps was only lent to us for a season – to get life and then return home. Perhaps she was never meant to be given to us in this life to raise – I don’t know. But at the time it seemed fitting and seemed to describe her life perfectly. As to why I don’t have the answers to all of that and it rips me up sometimes to not understand why I couldn’t raise her now with her siblings, but we find that this one line certainly reflects how we see her life and what she is doing now. Finally we ended with “Your love will light our way home“. Originally we were going to put “God be with you til we meet again”, which are the words of a well known hymn we sing at church. But then, right before we were going to send it off to be made I read the words “Your love will light our way home” and it touched my heart. I messaged Nathan at work and he agreed it was perfect. Her love, we hope surrounds us, moves us and guides us. We hope she watches over her siblings and helps our family and, having a child too perfect for this world and already in heaven, is great motivation and a light to follow in the darkness of this life. We wanted this line because throughout the years we hope it will stand as a reminder her siblings and to us of the eternal love we have as family and how we hope that that love will draw us all home again one day! I love her headstone. The grey granite and black text reflect our temple in Preston where we were married and sealed back in 2009 and again remind us of the hope that our family will continue beyond death. We felt the combo looked cool and we love the petite size it is. But despite all of that symbolism, it also feels so hard to have it there too – so small and on a grave for a baby – our baby girl that would be turing 4 this year. I love that she is acknowledged in the world now and that her plot of land is spruced up and lovely, but it hurts to see it all spelt out and yet, even with all of those mixed emotions I sat on Wednesday night in the sun and I realised that I would prefer to stare at that name than the dirt and fallen leaves. I would prefer for her name to be spoken than no one knowing anything about her! Her little piece of this world is finally marked. Her name is there for all to read. She is recognised and remembered – her existence is acknowledged! 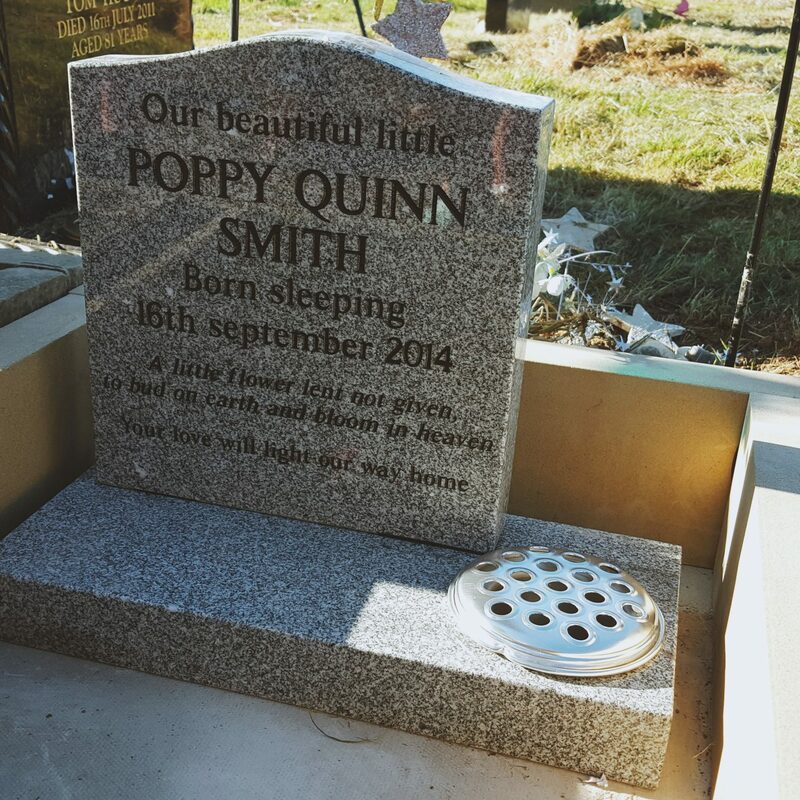 Our little Poppy finally has a headstone and neat little corner of the cemetery. It shows the world our reality, our loss and mostly our love and a piece of our hearts. 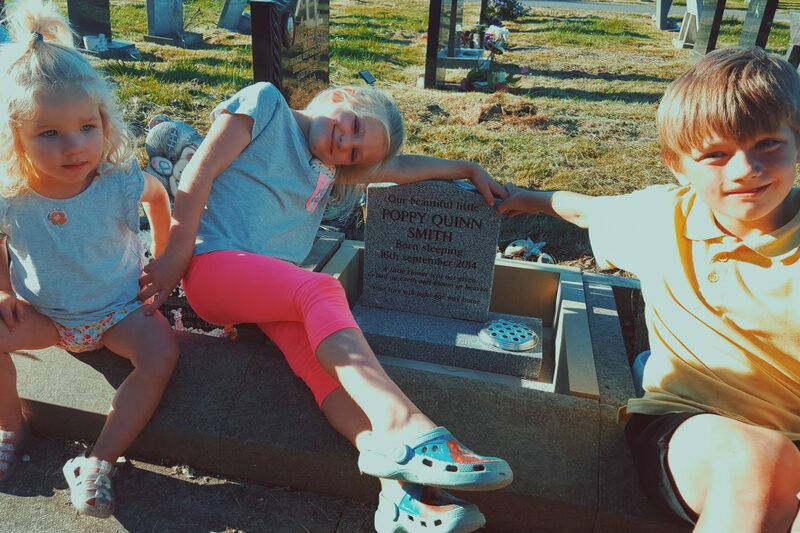 I loved seeing her siblings have so much joy to see her name there and have so much pride over her grave. 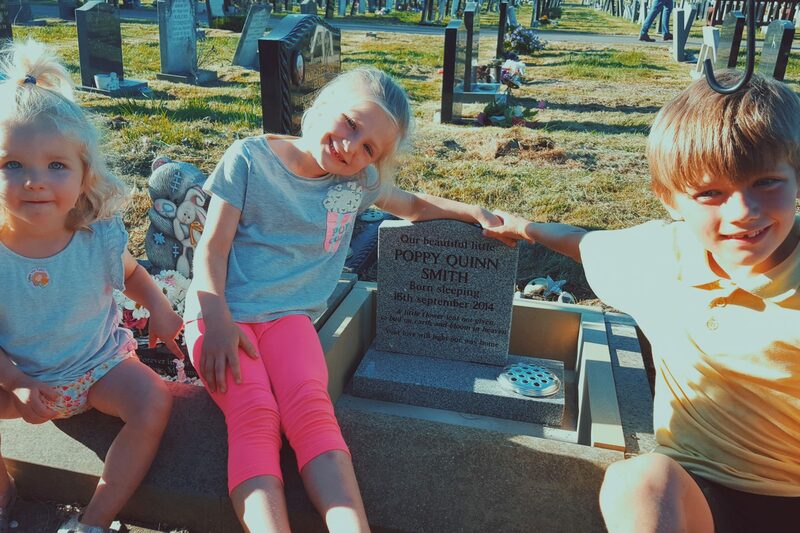 They are full of love for her and often feel her absence too – we love you Poppy and are glad to share you with love and pride in our hearts for who you are in our little family. Previous Post Fakeaway “Chicken Kebabs”! Next Post Some Summer Sale Bargains!